Buy one, get one FREE on already discounted items from Milk Factory! Here's the "fine print": Offer ends at midnight Monday, May 24th; offer does not apply to prior purchases; free item will be the exact same style, size and color; offer applies only to items as listed above - no substitutions; while supplies last; free item ships automatically; applies to online orders only. This is a crazy steal of a deal, as most items are already marked down $5 to $10! Stock up for Fall! Mix and match colors and sizes but you must mention the second beanie color and size in the comment box. While supplies last! this is the last of the last so there is a limited selection...if you see it, grab it or someone else will! Discontinued sizes - 6-12 and 12-18 month tee shirts; discontinued colors - blacks, navys, whites, and red; misfits - minor cosmetic flaws, marks and dye lot issues...5 bucks - do you care?! Shipping depends on location, and if you live in the Vancouver area you can choose FREE local pickup from their studio at 795 East Cordova Street. Shop Milk Factory at www.MilkFactory.com. 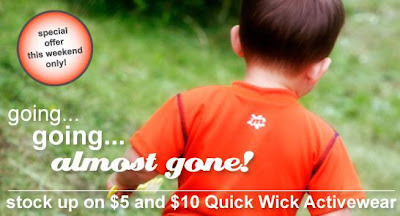 0 Response to "Super BOGO Sale on $5-10 Items at Milk Factory Quick Wick Active Wear for Babies and Toddlers"